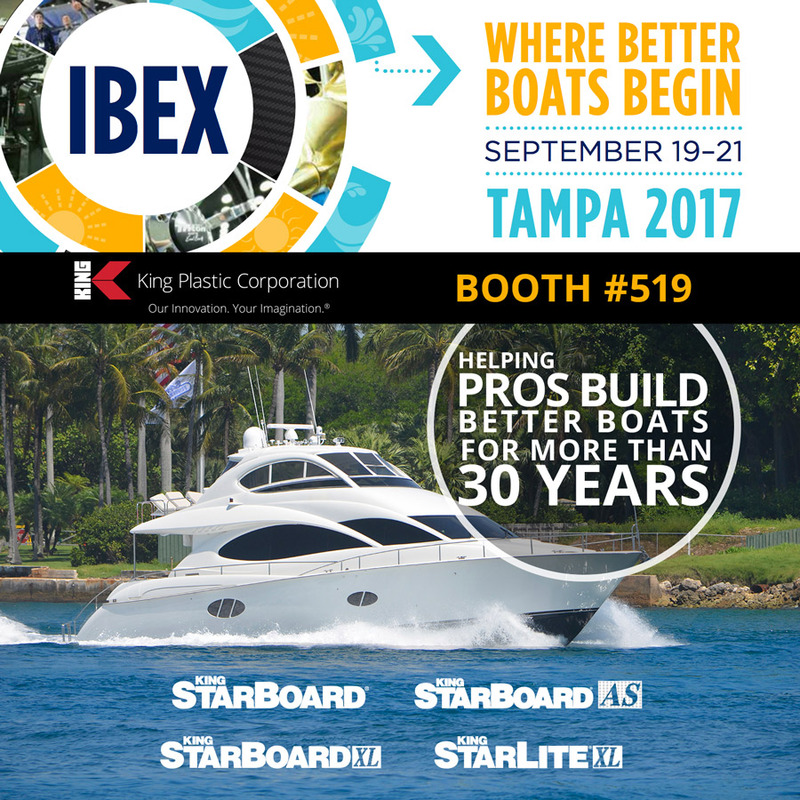 North Port, FL, August 6, 2017 – King Plastic Corporation, a leading manufacturer of polymer sheets, slabs and massive shapes will exhibit at the International BoatBuilders’ Exhibition & Conference (IBEX Show) held September 19-21, 2017 at the Tampa Convention Center in Tampa, FL. King Plastic will feature the King StarBoard® family of products in Booth #519. King StarBoard® – the original marine-grade polymer sheet. King StarBoard® AS – the anti-skid marine polymer sheet. King StarBoard® XL – the lightweight marine-grade cellular sheet. The IBEX Show is the leading marine industry event and where better boats begin. The event offers the IBEX Education Program, 500+ exhibitors on the show floor, dozens of networking events and much more. King pioneered the first marine-grade polymer sheet, King StarBoard®, which remains the dominant brand in the industry today. Using King Plastic’s proprietary K-Stran™ process, the company is able to achieve industry leading quality tolerances in dimension, density, finish and flatness. Finished products made from King StarBoard® sheets are easy to fabricate, impervious to water, and never need refinishing. Founded in 1968, King Plastic Corporation is a leading manufacturer of quality polymer sheets, slabs and massive shapes—including several products pioneered by the company. Its polymers are sold worldwide through a network of top plastics distributors to customers who fabricate products for the Marine Industry (King StarBoard® Brand), Signage, Food Service, Healthcare, Architectural, Industrial and other Markets. The company headquarters is a 150,000 square-foot manufacturing facility in North Port, Florida. For more information, visit www.kingplastic.com. IBEX is owned and produced by Professional BoatBuilder magazine and National Marine Manufacturers Association (NMMA), IBEX is the marine industry’s largest technical trade event. For boat builders, marine industry dealers, aftermarket suppliers and buyers, designers, repairers, surveyors, and boatyard/marine operators, IBEX is where better boats begin. For more information, visit www.ibexshow.com.